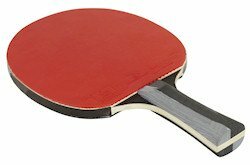 Top tips to help you choose your ideal table tennis racket. We saw in parts one to four, how to choose the right table tennis racket for YOU - one that's designed to suit your style of play. Well, if you've followed my recommendations and you've now bought a suitable racket, you'll want to make sure that you take good care of it. So how should you look after and care for your racket? What do you need, and what do the rules allow you to do, to your racket? There are two main ways that you can look after and care for your racket. The first is to buy a good quality racket case (sometimes referred to as a racket cover) to store it in. This will keep it safe from damage such as liquid spills, dirt and sunlight. An oblong shaped case (as shown above) rather than a racket shaped case (shown right) because it will offer more protection to the edges of your racket. Some of these oblong shaped cases also have an insulating foam inner, and some can also hold a second racket as well. The brand you choose will be a personal preference. When you've chosen a racket and paid (possibly) a considerable amount of money for it, you'll want to make sure that you keep it in good condition. My recommendation in part three was to use reverse rubbers on your racket, so let's take a look at how to clean these types of rubbers. There are three major factors that determine the durability of your rubbers - tension, flexibility and friction. The tension and flexibility of your rubbers will diminish over time, but you can minimise the loss of friction - i.e. the tackiness of the rubber surface which allows you to impart spin onto the ball - by following a regular cleaning routine. However, as I mentioned in part four, with effect from 1 September 2008 the International Table Tennis Federation introduced racket testing to check for unauthorised substances on your racket. This means that there's now a total ban on the use of all products which clean or improve the rubber. Table tennis rubbers must be used as they were when they were originally tested and authorised. You can read about these rules here. So you can no longer use any cleaners or boosters on your rubbers - you can only use plain water. And you are solely responsible for your own racket, which must be free of volatile organic compounds (VOCs). What about cleaners and sponges? Prior to 2008, some players used cleaning solutions which were applied with either a spray or a sponge. Manufacturers such as Butterfly offered cleaners which were designed to return the rubber surface to its tacky state. One had a pump feature which was designed to help you to spray it more precisely onto your rubbers, whilst the other had a sponge top which you rubbed over the surface of your rubber. But none of these are now permitted to clean your rubbers AND, even when they were, I didn't consider them to be good value for money. I just use a new cleaning cloth with a small amount of plain water and lightly rub it over my rubbers to remove any build up of dirt and dust. Then, when the rubber is completely dry, I keep it in my racket case until I need to use it again.